Established in 1994, GROTH Design Group is home to registered architects, LEED Accredited Professionals, project managers and designers, interior designers, construction administrators and support professionals. From Cedarburg and Milwaukee, we provide facility needs analysis, programming, master planning, architectural and interior design and construction administration services. Opportunities to help our clients range from single discipline studies to renovation and new construction. Our projects span a number of sectors, from religious, education and corporate to senior life, healthcare and community. 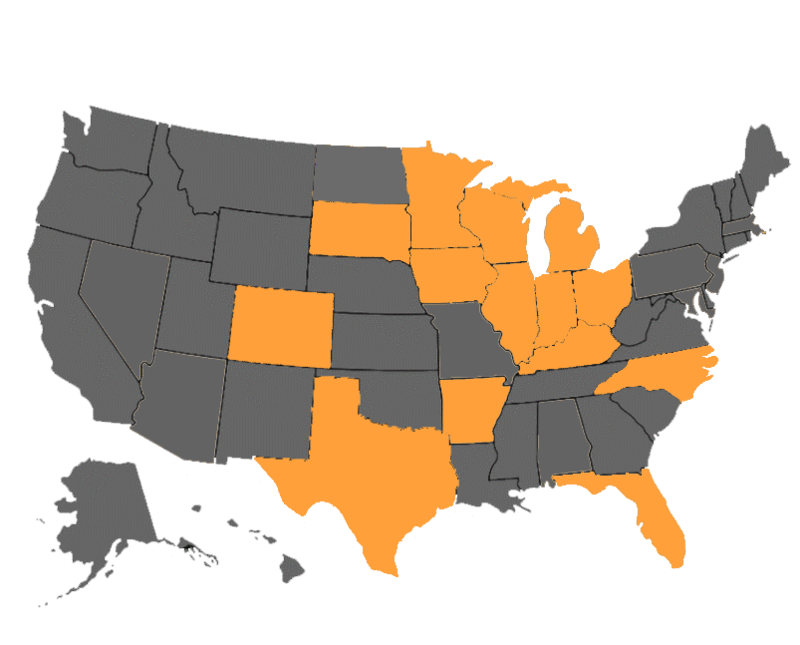 States in orange represent where GROTH Design Group is licensed and/or has built projects. We believe in design integrity rather than a predetermined design style. This means that we focus on the design process, trusting that developing an honest expression of our client’s program and character will lead to a building form of beauty, value, and craft. Our clients are our partners and we believe we are only successful if they are successful. This mandates that we listen and be actively engaged in understanding the needs and values of the clients we serve. Strong communication is the foundation of our success. It is fundamental to maintaining and nurturing respectful relationships with all team members engaged in the project. Being good stewards to the Earth we belong to is not a concept, nor a service; but rather a deep-seated belief. As our society increases its awareness of cultural diversity, we too celebrate ethnic, lingual, gender, experiential, physical and cultural diversity in our practice. We strive to be equitable and fair from respectful client interactions to just hiring practices. Points of view will differ, but finding reasonable solutions to accommodate these differences is at the core of what we do; not only as architects, but also as members of society. We seek to participate in and to help foster relationships grounded in mutual respect, where every participant’s point of view and gifts to the whole are welcomed, heard, understood, accepted and celebrated. We are architects, project managers, facility planners, interior designers, LEED Accredited Professionals, visualization specialists and construction administrators. Collaboration is a large part of how we implement our hallmark service. We begin by listening – identifying needs and aspirations, enhancing our awareness of place, context, region, climate and culture by exploring ideas and concepts. We always remain open to the myriad of influences that shape each solution, always seek to enrich the experience for our clients as we create facilities together – building trust as the project unfolds. It is an approach with which we have built a reputation for responsiveness and solving unique challenges since our founding 25 years ago. The projects we create must support the mission, vision, and needs of our clients. We ensure mutual understanding of these vital, but often intangible elements. We make certain design is driven by the fullest discovery of client needs and desires. Project success depends on facilitating a common vision and moving forward with mutually agreed upon goals and purpose. True success depends directly on how satisfied our clients are with our service. Their satisfaction is our focus. The success of our work is best defined by our focus on listening and on providing the assurance that every aspect of a design concept is evaluated in relation to a client's mission, values and goals. Employee talent is the cornerstone of our success. The staff of GROTH Design Group offers value by seeking effective and innovative design solutions in collaboration with our clients and partners, with a respectful approach toward mutual understanding. Our employees create value for our clients and in turn, we invest in the development of personal and technical skills of each employee. We also like to have fun along the way. Pre-project planning is the most important aspect of developing site and building. While it offers the greatest freedom to explore options, it is also where creativity comes face-to-face with the realities of conditions, regulations, and budget. GROTH Design Group balances these interests to allow our clients the very best opportunity to celebrate a completed project that goes beyond needs and expectations. We believe architecture is a specific expression of time and place which speaks to the aspirations of our clients. We recognize that programmatic requirements must be balanced with the intellectual and emotional aspects of architecture. We know that dynamic client relationships result in dynamic buildings; architecture is ultimately a collaborative process that involves the client, the public, other professional disciplines, artisans, and builders. Interior and architectural design are most successful when they are fully integrated, communicate the desired philosophy and personality and respond to the specific programmatic requirements of a project. Our close collaboration with our clients brings their organizational structure into focus, anticipates change, accommodates flexible space planning strategies, and allows for incorporation of current trends and design techniques. GROTH Design Group's culture is marked by giving back.